1 Pat the steaks dry with kitchen paper, then spread on all sides with the chermoula paste. Leave for at least 30 minutes to marinate. If you prefer, cover and chill for up to 24 hours in the fridge. 2 Preheat the barbecue (or grill/griddle). Spread the houmous over a large platter and top with rocket leaves. Cook the steaks for 2 minutes on each side for rare. Remove to a board and cover tightly with foil for 5 minutes. Thinly slice and place on top of the rocket. 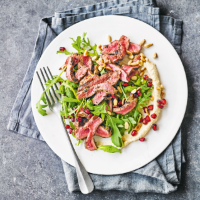 Sprinkle with pomegranate seeds and pine nuts to serve. Resting steaks (and any meat after cooking) relaxes the fibres to give more tender meat.